I feel kind of guilty. I regard Christopher Nolan as my favourite director and my hero, yet I had actually never seen Batman Begins. Even though I had seen The Dark Knight and loved every second of it. The main thing that I can say about this movie is that it yet again proves the genius of Christopher Nolan, who could have directed just another superhero movie. But what he did was made a geniune action packed, dark and thrilling film which earns it's place as one of the best movies ever made--something which a superhero movie can never really do. Batman Begins shows us the story of how Bruce Wayne (Christian Bale, a perfect choice) came to be Batman. He invented this caped crime fighter as a way to clean up the streets of Gotham City, which has turned into a mob-riddled city since the death of Bruce's father, who was killed after a night at the Opera. Batman is not the only trouble Bruce Wayne has though, as he is fighting his love for his childhood friend turned District Attorney Rachel Dawes (Katie Holmes, who I thought was okay, but Maggie Gyllenhaal did much better). While the film isn't as good as The Dark Knight (which is strange, because a sequel is never as good, even though TDK seems like a stand-alone movie), you can instantly tell what a great movie it is. The cast is everything: Bale, Holmes, Michael Caine, Liam Neeson, Cillian Murphy, Morgan Freeman...all fantastic. The script is inevitably well-done, and doesn't too much linger on the superhero aspect of it. Because, to me, superhero movies are always supposed to be cheesy as with silly one-liners and really bad special effects. 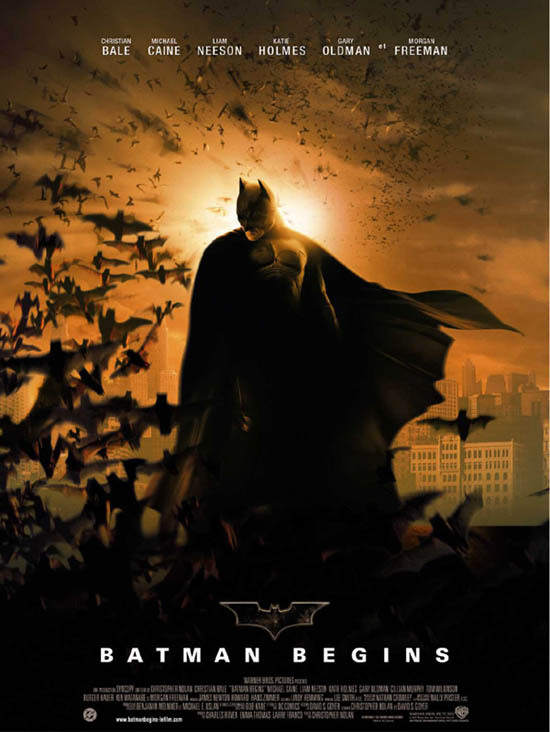 Batman Begins is never cheesy, has memorable quotes rather than silly one-liners and the cinematography is outstanding and completely captures the darkness of the movie. This was one of those movies where it was really really good, and people had high expectations of the next installment. And what did we get? The Dark Knight. Proves you have to be Christopher Nolan to do the impossible. I'll end with asking this: Christopher Nolan, what have you been drinking?! A fantastic movie from the master Nolan, who can never let me down.